I find money. Yep, that’s right; I’m one of those people who picks up every penny she sees. Why, just this morning I found 11 cents on my walk with Scrappy Doo, my beloved canine companion and nearly reformed street dog. My kindred spirit, Benjamin Franklin, said that a penny saved is a penny earned. I say that a penny found is a penny earned. My grandkids believe this, too. I know because I’m the one who takes them on money walks. 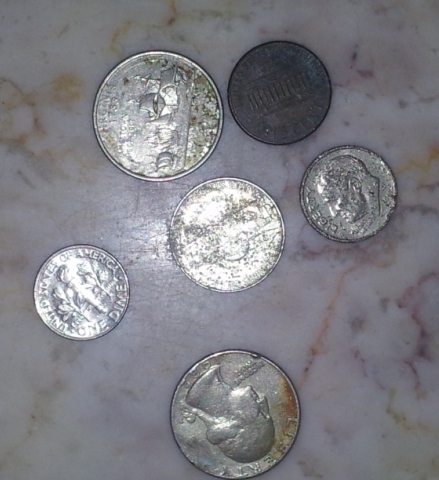 Our goal on these outings is to scour the streets, driveways, parking lots, and roadsides for lost change. Some days we only find a penny. Other days we are blessed with larger coins and even a bill now and then. Sometimes we find other kinds of treasures like full cans of mosquito spray (a value of about 5 bucks), nuts and bolts of all sizes and shapes, hats, t-shirts, drivers licenses (which we drop in the mail), and even stray dogs, ergo Scrappy Doo. How do we find something every time? It’s really rather biblical. We find because we seek. I have a friend who laughs about our money walks. My grandkids were aghast when she said she wouldn’t waste her time or energy bending over to pick up a penny. Maybe our family acts too – well – poor, even though we aren’t poor. No doubt, my husband and I came from very poor beginnings. We learned to live a certain way because of it. Our families sold pop bottles, shopped at garage sales and thrift stores, ate leftovers, and stretched every dollar. That kind of upbringing led us to save money to buy materials to build a house without taking out a mortgage. It’s why we bank at a place that pays us to keep our money there and change our electrical carrier every few months to get the best rate. It’s the reason we use credit cards that pay cash back and pay the balance every month so that we earn a few extra bucks and repurpose building materials we have leftover or find on the side of the road to create something inexpensive but beautiful and functional (My husband is a genius at this). We are always looking for money, and we find it. And that friend who laughed at us was pretty amazed at my cool Calvin Klein shorts (retail price $45) for which I paid $3.33 at a local thrift store. It’s all in the attitude, an attitude that City could benefit in developing. In April of this year, the Corpus Christi City Council learned that the city’s income was about $8 million below the budgeted expectation. When I saw that they dug into a few nooks and crannies and located exactly $8 million, I was amazed! How did they do it? The same way my grandkids and I do it. They looked for it, which is what I hope they’ll do before hitting us with yet another tax, this time to tackle the residential streets monster. I can’t help but wonder how many hidden dollars are lying unused within the various city departments. I suspect some of these dollars will find their way to the light of day once zero-based budgeting is put into place. But, why wait? They could start looking now. If my grandkids worked for the city and thought that money was somewhere to be found, a team of wild horses couldn’t pull them away! Hey, maybe there’s a summer job in this somewhere!